This unit is located on the 13th floor containing 1036 square feet of a desirable Beachside two unit offering breathtaking views of the emerald green waters and white sand beaches with both easterly and westerly views. 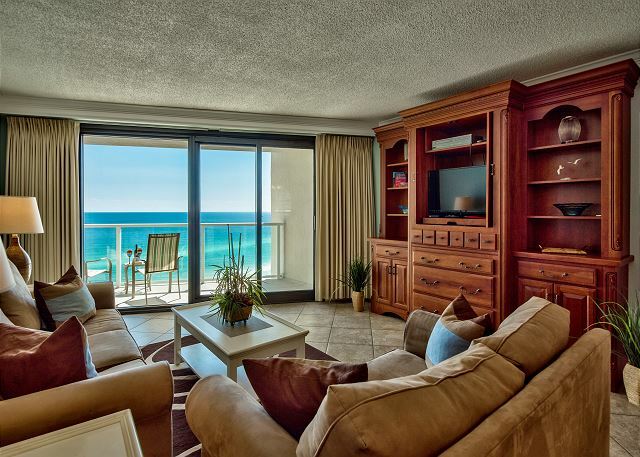 While staying in our condo you will relax as you enjoy the wonderful gulf views from the moment you walk in. As you enter the condo you notice that this is no ordinary vacation rental. 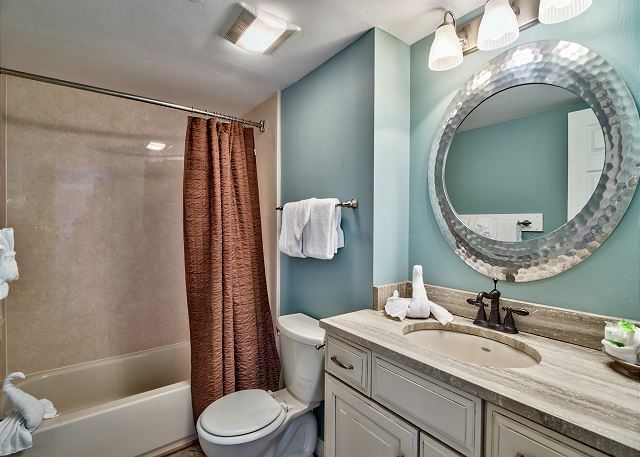 This unit has custom cabinets, granite counter tops (in kitchen and bath), stainless steel appliances, tile in kitchen, bathroom, living/dining and comfortable furnishings. 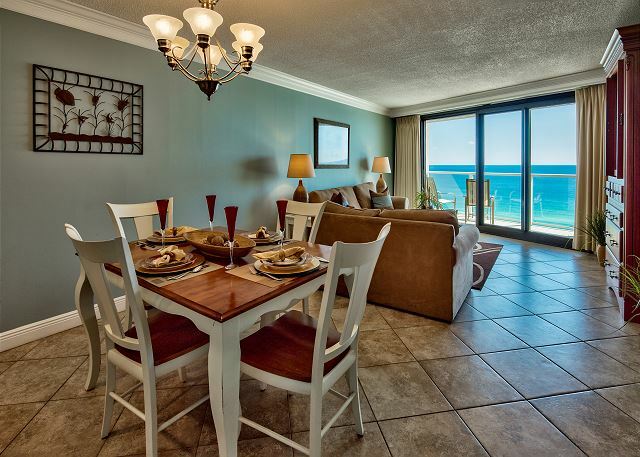 The entire condo welcomes you to sit and relax as you look out to beautiful Gulf waters and sugar sand beaches – you can see to the gulf from the living area, bedroom, and even the kitchen! Our condo has one bedroom and one bathroom. It is well-equipped and has everything you will need for your stay. 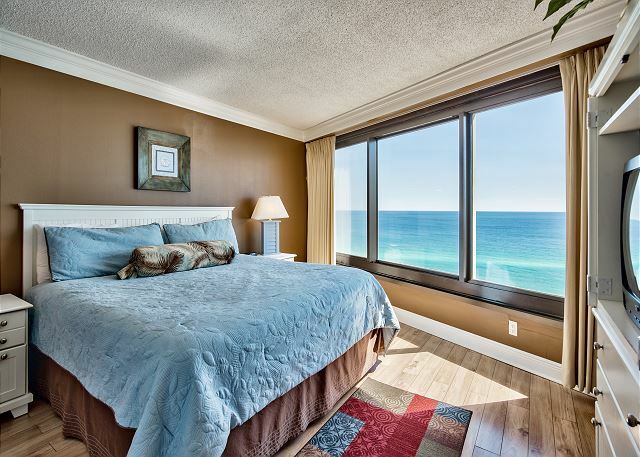 The bedroom has a king bed with a wall of windows looking out to the Gulf. The queen sleeper sofa in the living room provides additional sleeping quarters if needed. You may not want to leave this vacation paradise! 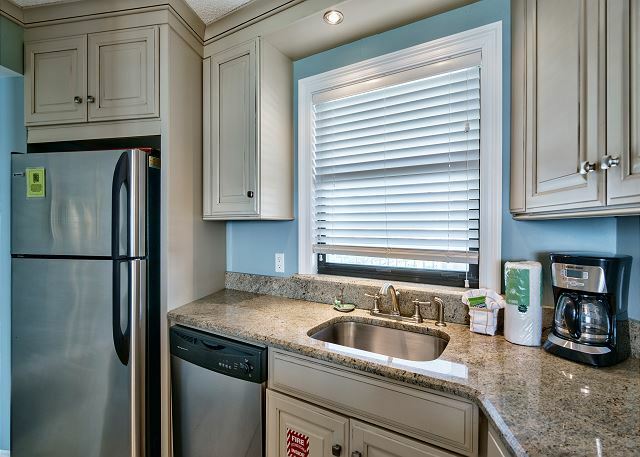 You also have free wifi, free tram to Baytowne Wharf, 2 beach chairs and an umbrella in the unit for your use, washer/dryer and no check in lines--you go directly to the unit. Loved the decor! Beautiful beach view! Even saw a wedding on the beach!! Enjoyed the rental- perfect for a couple!! My husband & I decided to spend my 30th birthday weekend at the beach. It was really foggy for most of our stay, but when the fog finally cleared...the views were AMAZING! The condo was beautiful & very clean and convenient to eating & shopping places, which happen to be a couple of my favorite things! The app made everything so easy. We have ZERO complaints. We did not want to leave! I’m sure we will be booking again in the near future. Very good over all. No issues with the unit. Great location. Only draw back was When we went to rent a gold cart to get around and were told that the association does not allow rents to have carts. Because of previous issues of parents allowing young children to drive golf carts, Security has disallowed rentals of golf carts on the resort. Fortunately you have the tram that we provide for free to our guests. The condo was clean, cozy and had a spectacular view. The building was quiet and very family friendly. The beach is also very clean and very easily accessible! Definitely going back next year! Overall we really enjoyed our stay. 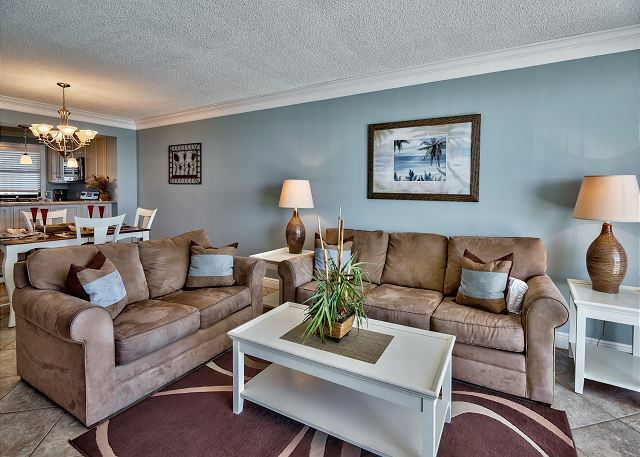 The condo was clean and attractively decorated. Everything in good working order. The only negative was the loveseat was wet. I assume they had cleaned it from the markings on the cushions. We could not sit on it the first 24 hours we were there. This was just a minor inconvenience however in an otherwise pleasurable stay. The view was spectacular. I didn’t even have to lift my head in the morning to see the ocean!! With a back to back clean, when we discover a piece of furniture that needs to be cleaned, we clean it to make your stay the best it can be. We apologize for that inconvenience, but are thankful you see what an awesome unit this really is. Our three night stay at #4328 for my birthday weekend was very relaxing. 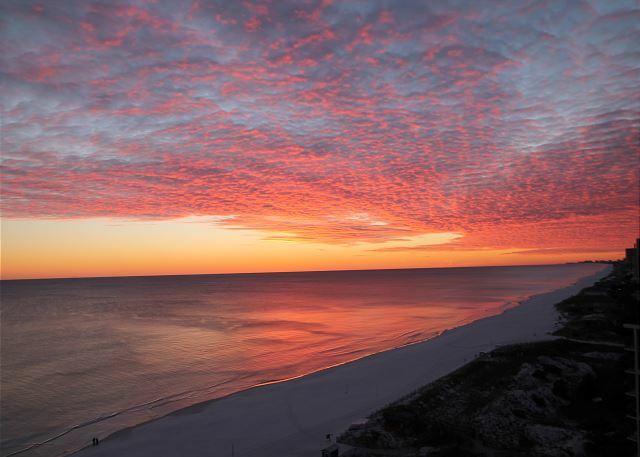 The accommodations were more than adequate and provided us with gorgeous views of the Gulf including sunsets! The condo was very clean and check-in/check-out directions were easy to follow. There was a nice waterfront restaurant with swimming pool next door, owned by the Hilton property but open to all. The condo's pool was better than the photos and WAS heated. The tram stop for riding to Baytowne Village was a very short walk, right next door and was the stop for access to the beach from other areas on the resort. 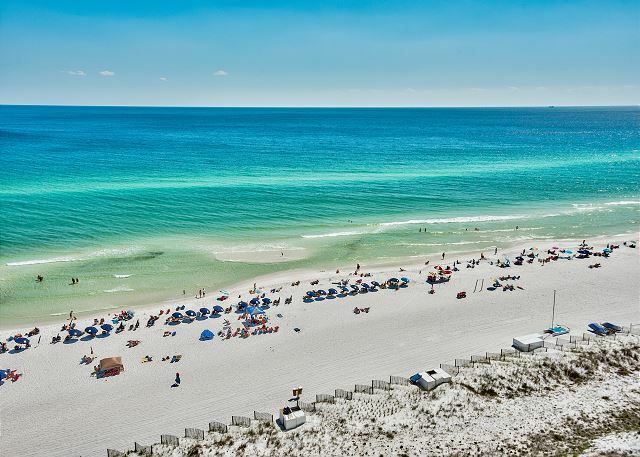 We plan to return to this area in June and have already secured a rental from Destin Memories. Just concluded our 8th one-month winter stay at 4328 BS II. usual. Terrific management attention to details and needs. Fantastic SW view. 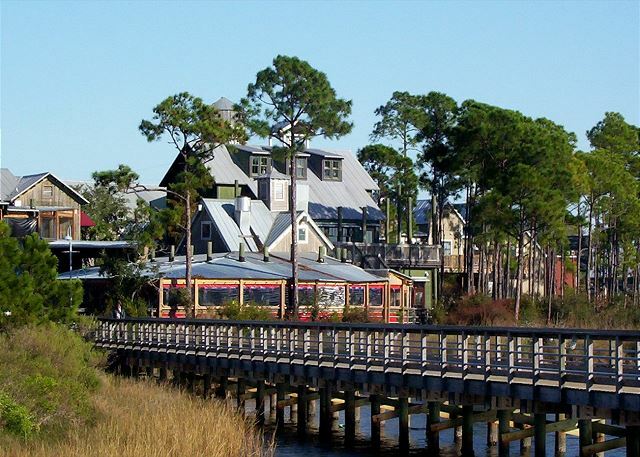 Lots to do at San Destin and in the nearby area. Already booked the condo for next year. Great clean condo. Great views of the beach and sunsets. In the summer, it is probably warm in late afternoon. However, in February it was great! Another great trip!! Thanks Bette! On a whim, my husband and I decided to travel to Sandestin Golf & Beach Resort right after Christmas for just a short trip. We've been vacationing at this resort for about 16 years and the past several we have rented a condo through Destin Memories. Each visit, I have been lucky enough to work with Bette and I can't say enough good things about her. She is always quick to respond, very helpful and makes the rental process very easy. This is the first time we stayed in this particular condo and we loved it! 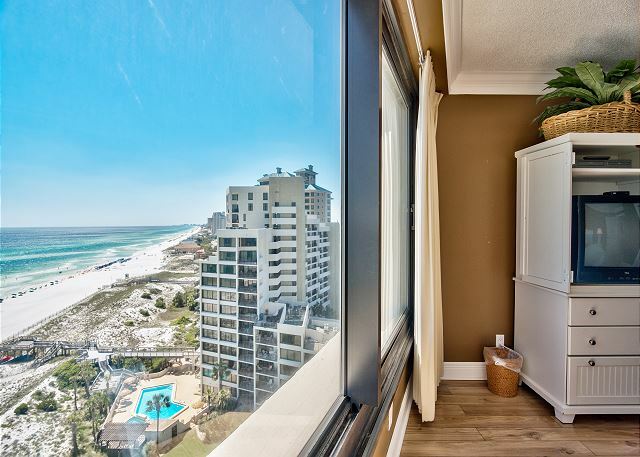 The condo has everything you need and the views are amazing!! The condo was beautiful. It was very clean and everything is brand new. The view was out of this world. We woke up early to watch the sunrise and watched the sun set as well. It was amazing. So beautiful. It was such a cold weekend but it still felt like Summer being on the beach. Everything was perfect. We will definitely be back to this condo. Thanks! The view is to die for! Beautiful condo and loved every minute. I plan to book all my beach vacations with this unit. Condo was ready and in great shape when we arrived. They have beach chairs and umbrellas in the condo for you to use. Didn't use washer and dryer. Bathroom sink was clogged when we arrived and very slow to drain. Kitchen is great, has everything you need to cook, bring spices if you want them. Balcony was incredible. Oncall is there for you to care for clogs or any issue you have with the unit. We are thankful you enjoyed your stay. Beautiful rental with great views. Very clean and spacious. We had to contact the company while on vacation they were very helpful! We would highly recommend this condo and would stay here again on our next trip. I am so thankful our 24/7 oncall service was there to assist your needs. Come back often! We are here for you. Clean rental in a family friendly location. Second year booked with this company and service and room are wonderful. Let's make it a third. We stayed a week in 4328 Beachside II. The property was just as the pictures display. The VIEWS were amazing and I loved waking up to the view in the bedroom(comfy, huge bed) as well as a balcony view. The condo was a little older, but clean and well stocked for all our needs. The tub/shower curtain wasn't completely clean and the shower could use an update, but I'm picky about a nice shower:)The only other suggestion would be more mirrors! Maybe a full length one somewhere. The bathroom one & a small one on the bedroom wall wasn't the best even for two people when getting ready for dinner. Overall, we loved it & the location! (also, right across the street from baytowne wharf) Everything went smoothly with booking & we enjoyed our stay! Loved our time at this condo. Great for small family with one or two children. Amazing views which were unforgettable. Next time we are back we hope to stay here again as long as the rates are reasonable. Only concern is the rate can be pricey but for what we paid it was a fair rate for the amazing experience and memories. I'd recommend this unit and property management company. Thank you, Jeff. Please come back as this is a great unit to enjoy. We thouroughly enjoyed our visit to Sandestin Golf & Beach resort. The whole resort is absolutely beautiful and our accomodations were great! Our view was fabulous as well! We couldn't have asked for a better experience all around. We are so thankful you see how awesome the unit is as well as the resort. Come back often. As usual, my wife and I had a wonderful time during our one-month stay (Feb.-Mar.) at 4328 Beachside II. This was our seventh year in a row at 4328. I guess that says it all. 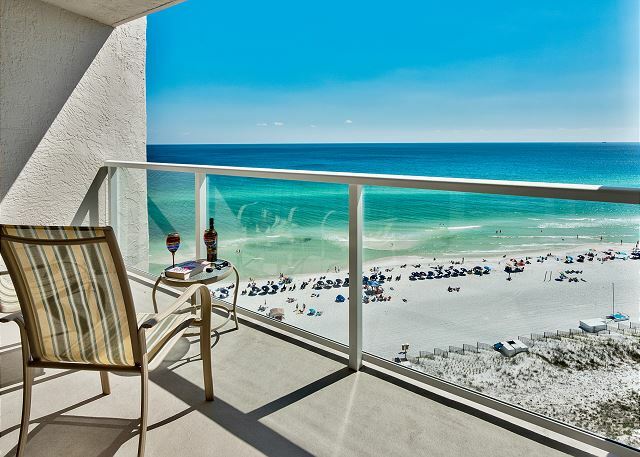 Great view, great management and an ideal location at the San Destin Resort. We're already looking forward to year number 8. And we are looking forward to having you back. I am glad you see our management company as great as we do give our all to our guests. Wonderful condo with a great view. Very comfy bed. The only small issue was the tub stopper not working. We had a wonderful getaway in this condo. Very accommodating for the two of us. Conveniently located to restaurants, shopping, etc. Loved having easy beach access. Beach chairs need replacing, Our week stay was great. Gail, thanks for letting us know about the beach chairs. We will certainly replace them. Otherwise glad you enjoyed the stay. Our stay at Beachside 2 was wonderful! Our condo was very clean, and it provided the basic necessities. It was also very quiet and private. The resort location is convenient. We enjoyed shopping nearby and eating at various restaurants. The view of the water/beach was gorgeous. Overall our stay was pleasant and relaxing. We would love to repeat the experience. We have already recommended this property to other family members. 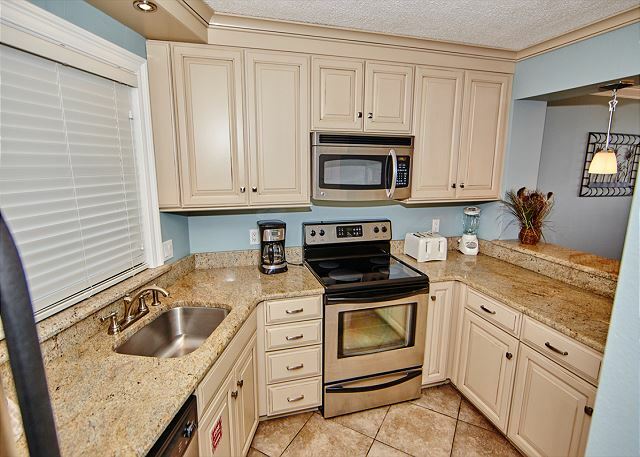 Peggy, I am so thankful you see what a great unit this is and the fabulous experience of Sandestin beach. Please come back often. I am here for you. In the past years, I have rented several different units in Beachside II, but this one is absolutely the best one so far! Destin Memories had replaced the mattress prior to my stay, which was really great. 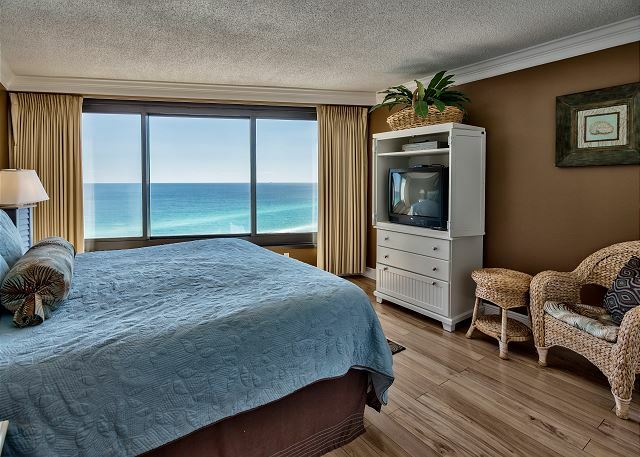 Unit was very clean, views amazing, and the entire Sandestin resort immaculate! And Bette made my day by delivering an unexpected birthday wish! Thanks again for alle your effort Bette, really appreciate it! I am so glad you enjoyed your stay. Come back often. This was our 4th experience at Sandestin, our first on the ocean side. I must say that when you walk in the door all you notice is the beautiful view of the gulf! The unit itself was very clean and comfortable. There were a few things that I feel could have made it a better stay. There was construction going on in the unit next door, (not the owners fault), they could have provided tissues, a few more towels and hand towels especially, and the dining table was a bit dated and beat up, but really we pretty much sat on the balcony when we were eating in or just having our morning coffee and evening cocktails. The unit was adequate and none of those things would hinder us not staying again. The location was perfect for the beach and going next door to the beach bar and restaurant, which we did often, the food is really good there. The resort is immaculate and perfect. We love it there, the ocean and beach and all the resort has to offer! I am so sorry about the noise next door, but that is an issue for which we have no control. Each unit should have a minimum of 4 towels and if that was not what you had I wished you had called our 24/7 oncall to assist you. Please come back often! Our experience was wonderful, with the exeception of bathroom needs some upgrades, especially the shower. The mattress on the bed was not of the best quality, very lumpy. But overall, I would recommend the property to anyone. We are planning on returning next year. Thank you for your review. We will be checking on the mattress and shower. Come back often. We are so thankful for your long extended stay. Come back sooner vs later. Awesome condo! 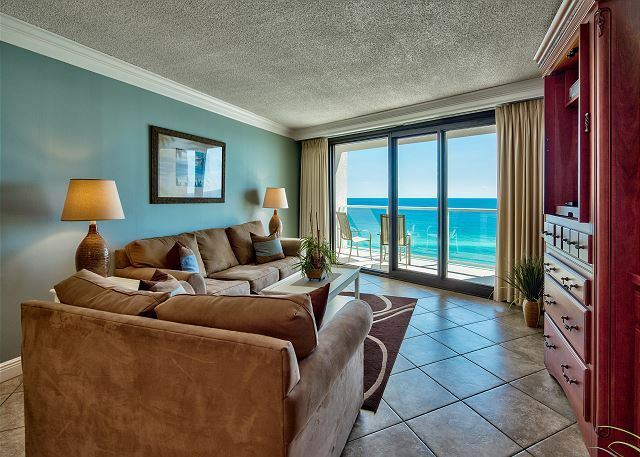 Gulf views were perfect and the condo well furnished. Will stay here again and again. This is my second time renting the same unit from Destin Memories. It's always been a great experience. The only disappointment this trip were the beach chairs and umbrella in the room were not the greatest. I would suggest bringing your own. I'm sorry you did not call our oncall as they certainly would bring you suitable beach chairs and an umbrella. Obviously these do wear out with a lot of use. My experience with Destin Memories was excellent. Bette was amazing and always made sure all of our needs were met and she answered every question I had quickly and with enthusiasm. I really had a great time. Beachside II is in a great location. 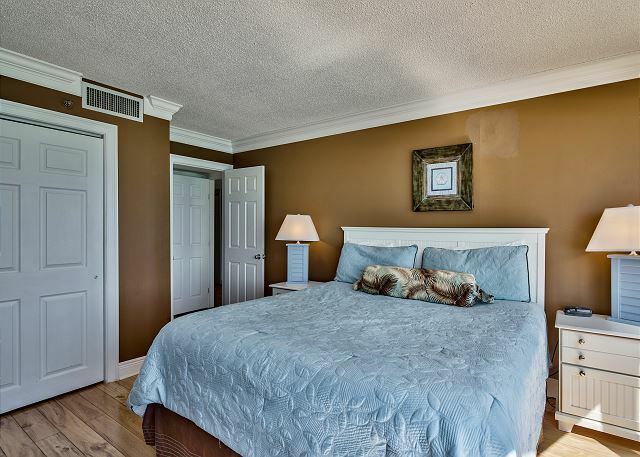 Located right on the beach and just a short walk, or drive to nearby restaurants and activities. I would highly recommend a stay here! Thank you for the personal comments and we are so glad you enjoyed your stay. Come back often! We had a wonderful stay at this property! It was beautiful and very comfortable. It was the perfect location and had an incredible view. Bette and Greg were amazing to work with! The condo was amazing and extremely well suited for our trip! We at Destin Memories are a team and work as a team to keep our guests happy. Thank you for your review of this awesome unit and come back often. Great place to stay at Sandestin!! We had a great experience at 4328 Beachside II. The condo was very clean and had spectacular views from the living room and bedroom. The kitchen was stocked with dishes, pots, pans, and utensils for cooking breakfast, etc. The bathroom was clean but the shower somewhat dark due to the dark colored shower curtain and the curtin being installed oddly. The pool area looked to be nice; however, we were unable to access during our stay due to someone throwing a glass bottle in it and the pool having to be drained, cleaned, and refilled. It was nice having beach chairs and an umbrella in the closet to use instead of having to rent. The amenities in Sandestin were great. We used the tram service that was included in our stay to go to The Village at Baytown Wharf, which was fun and had great places to eat. Wonderful and clean unit with stunning views. Great shopping and restaurants nearby. 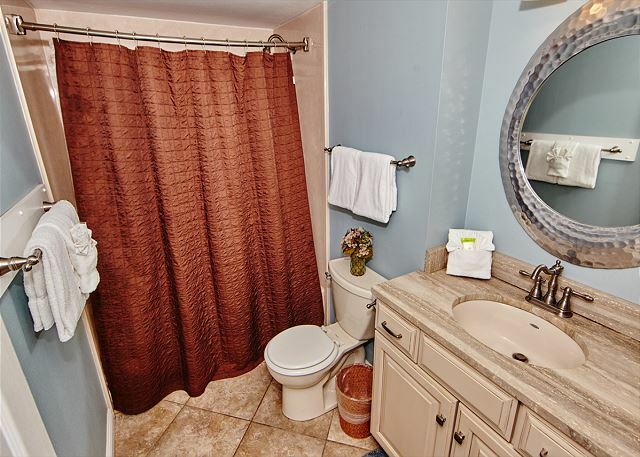 The property exceeded our expectations in all genres (cleanliness, view, furnishings, etc....). I would definitely stay here again and/or recommend to my friends. Thank you so much for your review of this unit. It is truly a great unit and we are happy to have had you guys with us. We look forward to having you again soon. Lovely view and perfect location! Property description was accurate, but the balcony photos show much nicer chairs than those actually provided (2 small cheap chairs and 1 small round table). 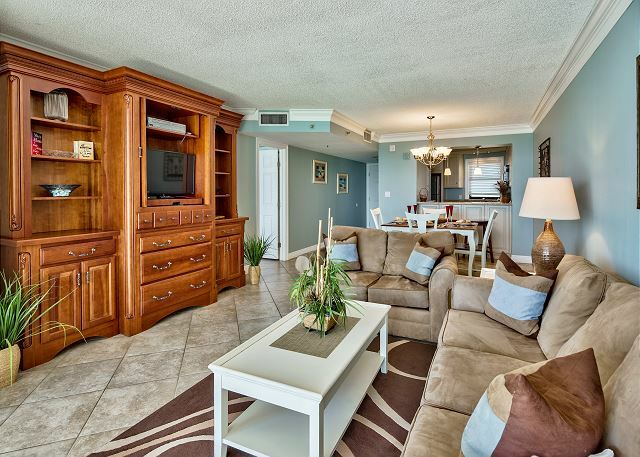 I've rented many condos over the years, including Beachtower II 4 or 5 times, and never have the photos shown furniture different from what is actually there; disappointing. Kitchen counters were "gritty" when we arrived. Otherwise, everything was clean and in good working order. After opening the lockbox and using the key to open the door, reentering the code (to put key & lockbox cover back) proved problematic; be sure to push each number down very hard to make each one click! These were the only slight negatives to a wonderful stay, though! Beach House restaurant right next door has great food & awesome view! Love the Village on the Wharf restaurants and shops! We did the Wine Festival Brunch on the Bay -- terrific food and drinks of all sorts! Love Sandestin! Outlet mall and grocery stores are within just a few blocks, so convenient, too! I guess the simple fact that we have been spending a winter month at 4328 Beachside II for the last 6 years (and next year will be number 7) says it all. Fantastic view, well maintained, very clean and managed beyond expectations. 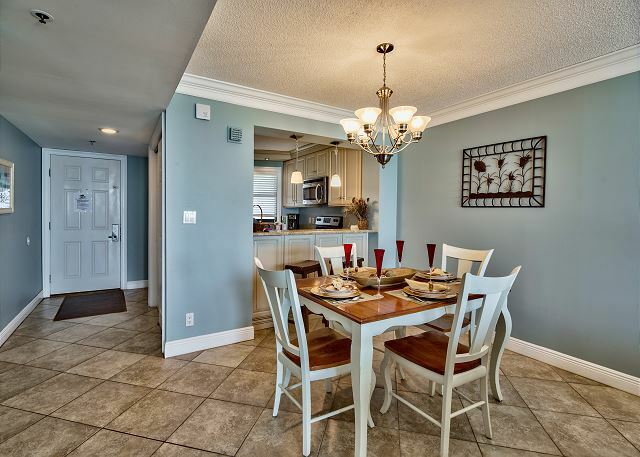 Not only is the unit wonderful, but the San Destin Resort is awesome. Thanks, Lee. We strive to make the unit meet your expectations!